Support for creating and maintaining project budget data including schedules, actuals and forecasts. Support for analysing progress reported against the work schedules and produce reports on projects’ progress performance and forecasts. Alternatively It is easy to do a search under “Manchester Council Jobs” and then follow any links under see vacancies. You can then use the drop down menu on the left side (under “All job Type” to select apprenticeships. Here at Kids Around the Clock we are expanding our family by looking to employ someone who is fun loving and caring. We are an award winning nurseries set in the heart of Wythenshawe, with a setting in Woodhouse Park and a setting in Benchill (Brookfield’s Gardens). We have over 19 years’ childcare experience and thrive on delivering high quality childcare. Each setting caters for children aged from 0 to 16 years old. We have a variety of shift patterns to meet employee’s individual needs and a number of great staff benefits. Our settings have been rated Outstanding by Ofsted. Our settings are bright and airy with lots of space for children to explore, promoting a safe and secure environment for children to grow and learn, with high quality outcomes. We at Kids Around The Clock are looking for strong individuals to join our KATC family. If you are wanting to expand your knowledge, acquire new skills and join our career path, this is the Company for you. 2019 Liftoff! All rights reserved. 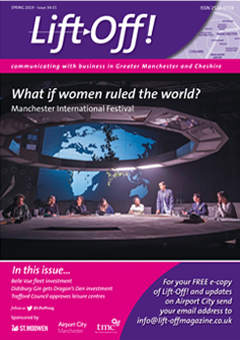 Lift-Off Business magazine is produced by TMC, a co-operative media agency based in Sharston, Wythenshawe. Lift-Off does not attract any funding and is funded totally by advertising revenue and sponsored pages.